You can also view more on the next upcoming Releases in our Enteprise Roadmap available here. If you are using GitHub Enterprise 2.13, support for multiple Issue templates will not be available as this is not supported in GitHub repositories in 2.13. As Issues flow across the Board, use the diagram to visualize Issue throughput. Throughput helps teams track not only how much work is accumulating within each pipeline across a set date range, but also helps shed light on bottlenecks and areas for process improvements. Learn more and book a personalized (free) Kanban coaching session to understand how to interpret your team's diagrams. You can now hide Epics on the Board by selecting Hide Epics from the Epic filter dropdown. When making bulk changes to Estimates using multi-select, you can now clear Estimates! Bug Fix The repo switcher is now properly aligned visually with the rest of the elements surrounding it. Bug Fix Icons on collapsed pipelines are now properly aligned to the text on the pipeline. 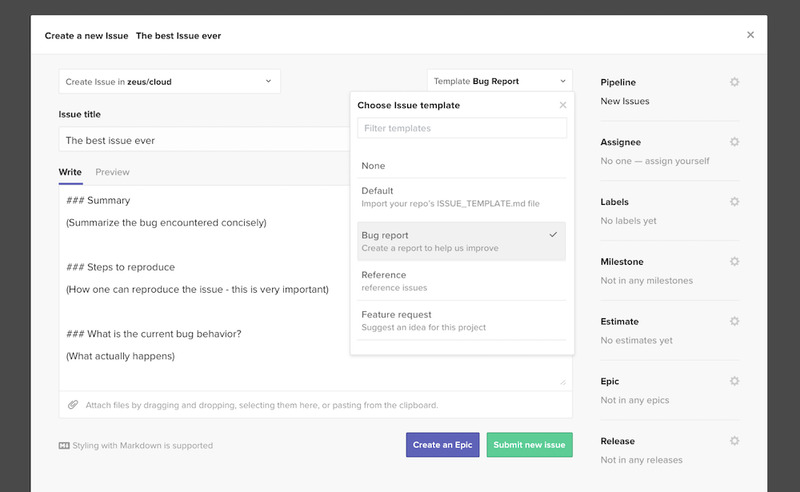 Bug Fix When on GitHub Project or Code tabs, ZenHub will now properly open when navigating back-and-forth. Bug Fix Workspace names and descriptions no longer appear clickable when you don't have the needed write permissions on the repository to make edits. Bug Fix The Today line on the Burndown now properly shows up when the date is beyond the chart's date range. Bug Fix The activity tab in the Release report no longer leads to a blank screen. Bug Fix When searching for Issues in the Board where other filters are active, the any / all filters will no longer create false positives due to an active text search. Bug Fix Descriptions can now be cleared from Workspaces. Performance We've made improvements to how ZenHub renders in GitHub, meaning snappier loading times! ZenHub Enterprise 2&period;30 supports the following GitHub Enterprise versions: 2&period;13, 2&period;14, and 2&period;15. We have deprecated official support for ZenHub Enterprise versions below 2&period;24. We officially support the following ZenHub Enterprise versions: 2&period;30, 2&period;28, 2&period;27, 2&period;24.